Some of us have been here before. Many people living today in America and around the world have direct experience with countries where an autocrat has seized control. Others have seen charismatic, populist leaders come to power within democracies and dramatically change the rules of the road for the public, activists, and journalists alike. 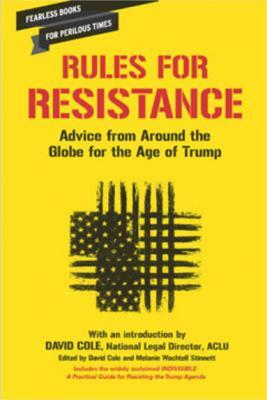 In Rules for Resistance, writers from Russia, Turkey, India, Hungary, Chile, China, Canada, Italy, and elsewhere tell Americans what to expect under our own new regime, and give us guidance for living--and for resisting--in the Trump era. Advice includes being on the watch for the prosecution of political opponents, the use of libel laws to attack critics, the gutting of non-partisan institutions, and the selective application of the law. A special section on the challenges for journalists reporting on and under a leader like Donald Trump addresses issues of free speech, the importance of press protections, and the critical role of investigative journalists in an increasingly closed society. An introduction by ACLU legal director David Cole looks at the crucial role institutions have in preserving democracy and resisting autocracy. A chilling but necessary collection, Rules for Resistance distills the collective knowledge and wisdom of those who "have seen this video before." David Cole is the legal director of the American Civil Liberties Union, a frequent contributor to the New York Review of Books and The Nation, and the author of books including Enemy Aliens and Engines of Liberty (both from The New Press). He lives in Washington, D.C. Melanie Wachtell Stinnett is former director of policy and communications at the Tobin Project and co-author with Senator Sheldon Whitehouse of Captured (The New Press).